You’ve heard the term before, but do you really know what is a dry bar and what’s a wet bar? And, more importantly, what the heck is the difference between the two? Isn’t a bar a bar? Ultimately, both are for the purpose of making entertaining more convenient. So tell me already! A dry bar is basically furniture designed to hold bottles, barware, and other things such as appetizer plates or cocktail napkins. They are often equipped with toothpicks, napkins, coasters, ice bucket/tongs, and even cocktail umbrellas and wine charms. Dry bars are generally about counter-height in order to aid the preparation of drinks. There are some dry bars that are elaborately constructed into a room. They include wine racks, shelves, even a mini-fridge. 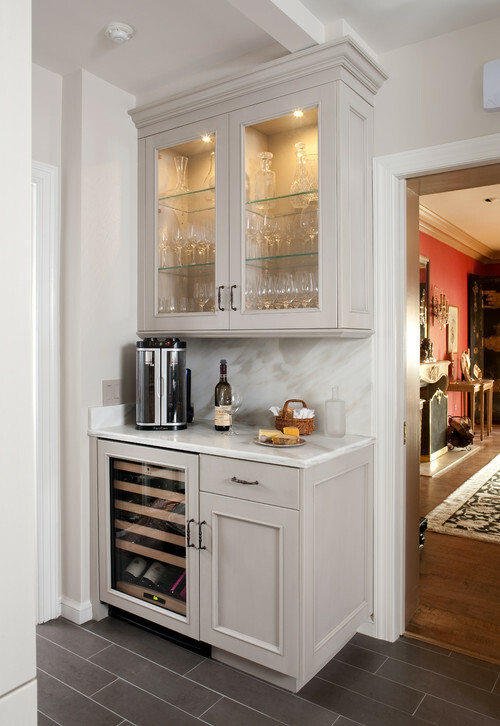 With a dry bar, you can offer guests an accessible spot to mix beverages without going through kitchen drawers looking for ingredients or utensils. Dry bars are a great way to have a bar in your home. If you’re looking to take your bar to the next level and aren’t afraid of some plumbing, consider a wet bar. Looking to buy a home with a dry bar?